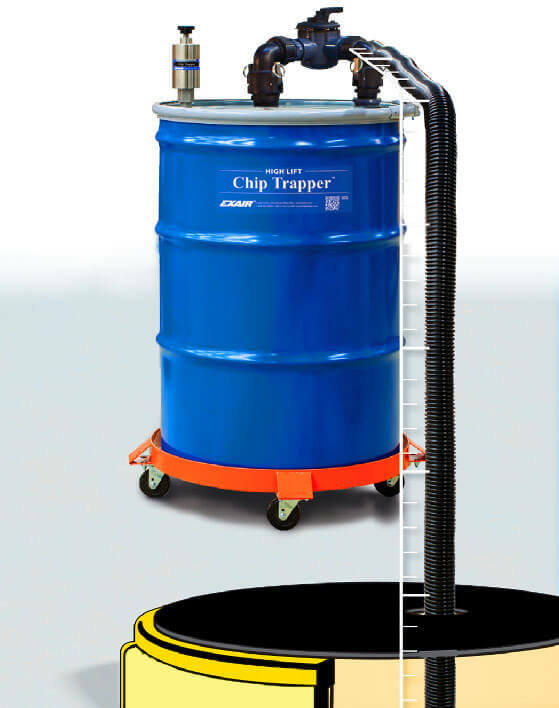 High Lift Chip Trapper™ – Filter chips and solids out of used coolant and liquids from below grade sumps or elevated tanks! The patented* High Lift Chip Trapper offers a fast, easy way to clean chips, swarf and shavings out of used coolants and other liquids. The High Lift Chip Trapper vacuums the coolant or liquid that is filled with debris and traps all the solids in a reusable filter bag. Only the liquid pumps back out. It is ideal for use on pits, wells, below grade sumps, tanks and storage containers of contaminated liquids. 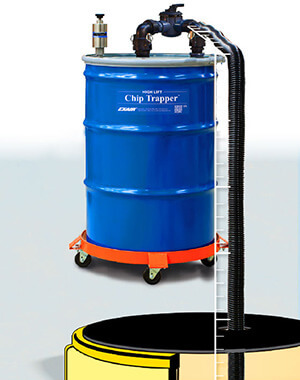 The High Lift Chip Trapper uses EXAIR’s compressed air powered Reversible Drum Vac (included) that can fill or empty a 55 gallon drum in less than two minutes. Simply set the Reversible Drum Vac pump and directional flow control valve on top of the drum to “fill” for it to quickly vacuum the liquid with solids. Once the sump, pit or tank is empty, set the pump and directional valve to “empty” for it to pump out clean coolant/liquid. All the chips and other solids are trapped inside the reusable filter bag of the High Lift Chip Trapper. 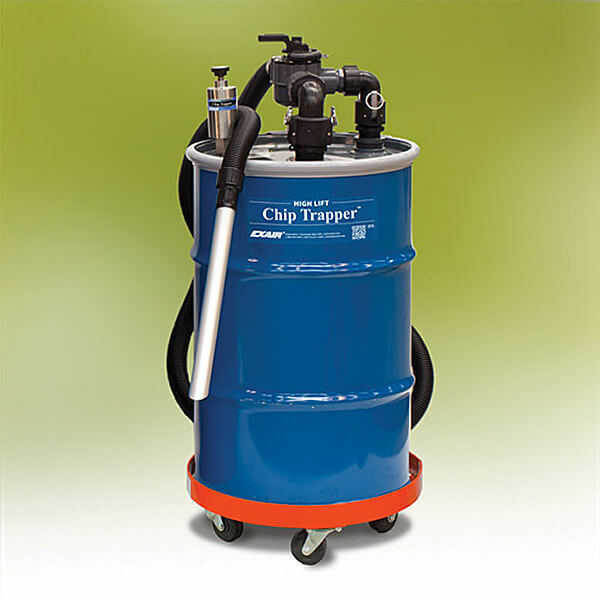 6190 55 Gallon High Lift Chip Trapper includes the High Lift Reversible Drum Vac pump assembly, directional flow valve, 55 gallon drum, lever lock drum lid, shutoff valve, 20′ (6,1m) flexible vacuum hose (1-1/2″/38mm I.D. ), 20′ (6,1m) compressed air hose, chip wand, (2) filter bags and drum dolly. 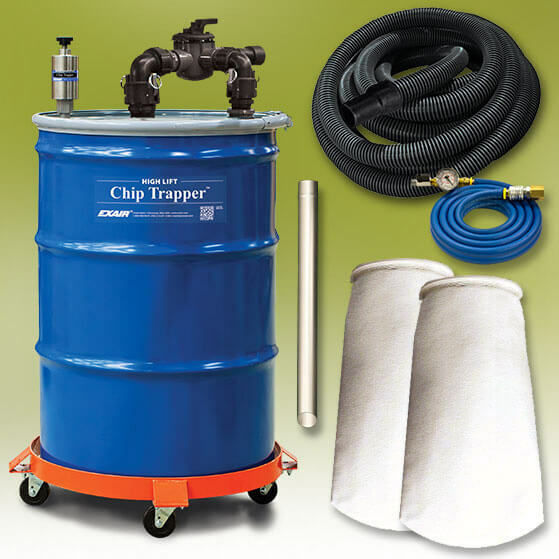 6190-30 30 Gallon High Lift Chip Trapper System – same as Model 6190 except includes a 30 gallon drum. 6190-110 110 Gallon High Lift Chip Trapper System – same as Model 6190 except includes a 110 gallon drum. 6095 High Lift Reversible Drum Vac Only – included in all systems listed above.